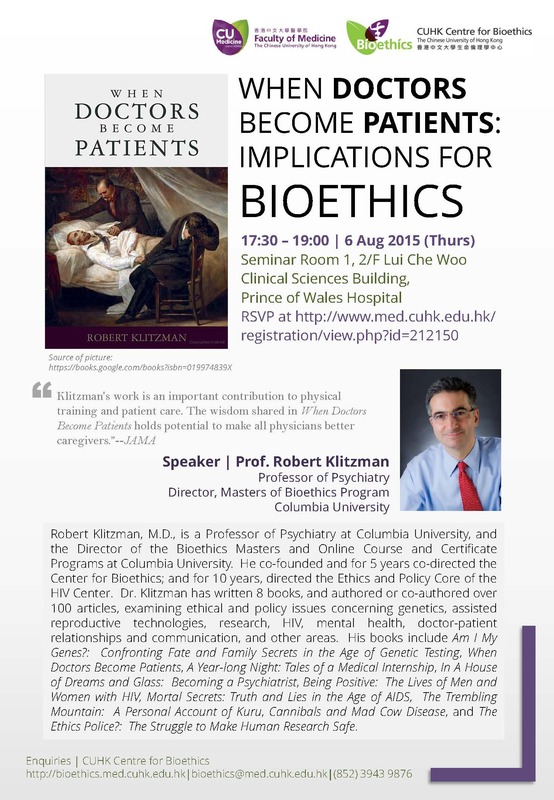 Robert Klitzman, M.D., is a Professor of Psychiatry at Columbia University, and the Director of the Bioethics Masters and Online Course and Certificate Programs at Columbia University. He co-founded and for 5 years co-directed the Center for Bioethics; and for 10 years, directed the Ethics and Policy Core of the HIV Center. Dr. Klitzman has written 8 books, and authored or co-authored over 100 articles, examining ethical and policy issues concerning genetics, assisted reproductive technologies, research, HIV, mental health, doctor-patient relationships and communication, and other areas. His books include Am I My Genes? : Confronting Fate and Family Secrets in the Age of Genetic Testing, When Doctors Become Patients, A Year-long Night: Tales of a Medical Internship, In A House of Dreams and Glass: Becoming a Psychiatrist, Being Positive: The Lives of Men and Women with HIV, Mortal Secrets: Truth and Lies in the Age of AIDS, The Trembling Mountain: A Personal Account of Kuru, Cannibals and Mad Cow Disease, and The Ethics Police? : The Struggle to Make Human Research Safe.